Scattered showers have become a regular part of Bay Area life over the past few days and that is not changing any time soon. For at least the next week, scattered showers will be a likely occurrence every single day, NBC Bay Area meteorologist Craig Herrera said. Another storm hit the Bay Area Thursday night, bringing rain here and lots more snow in the Sierra. A high surf advisory that started Wednesday will also last through the weekend. The recent rainstorm brought more than just rain to the peak of Mt. Hamilton. The advisory warned of swells of up 20 feet between Sonoma and Monterey counties. The high surf and high tide did not appear to be great enough to cause flooding. Snow was expected to continue to fall in Bay Area hills, in some cases as low as 2,000 feet. 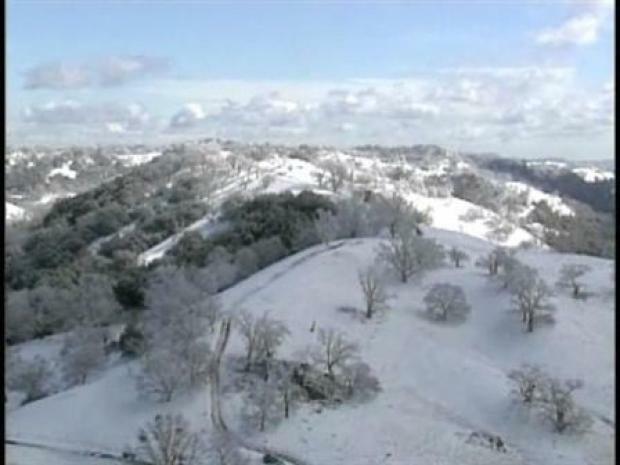 Temperatures were below freezing in Bay Area hills above 2,500 feet Thursday morning. Mt. Hamilton is 4,360 feet. Mt. Diablo is 3,849 feet. Mt. Tamalpais is 2,571 feet. Mt Umunhum in the Santa Cruz Mountains is 3, 486 feet. More showers are expected Friday and another round of rain Saturday night through Sunday, Herrera said. "I think by this time next week - by next Thursday or so, we will have made a nice dent in our rainfall totals," Herrera said. "Right now we are about 39 to 58 percent of normal." Moffett Field has reported receiving 4.93 inches so far this rainy season. The average amount received there is 8.44. The greatest discrepancy between how much rain has fallen so far this year and the historic average is in Santa Rosa. 7.62 inches have fallen, but the city normal has received 19.77 by now. In order to seriously discuss a possible end to California's current drought, the state would have to make up, then exceed by at least 50 percent, the state's average rainfall totals. That is partly because the last two seasons were only about 78 percent of normal. Another two feet of snow was also expected to fall in the Sierra, Herrera reported. "I would just advise people to carry their chains with them if they are going to the Sierra -- food and water too," Herrera said. "People have to be careful with snow expected to arrive between now and the middle part of next week." More than nine inches of new snow fell on the ski resorts’ higher elevations in the last two days, on top of nearly two feet that hit North Lake Tahoe last Monday.